Emily Kurn Aug 10, 2017. 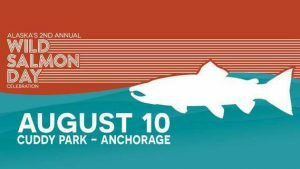 Communities statewide will observe the second annual Alaska Wild Salmon Day today. The holiday was established last year when Gov. Walker signed House Bill 128, designating every Aug. 10 as Alaska Wild Salmon Day. This day gives residents an opportunity to celebrate their love of salmon with their communities and calls attention to an energized movement of Alaskans seeking to protect wild salmon through encouraging responsible resource development in the state. Wild salmon plays a unique role in the lives of nearly all Alaskans – from subsistence, commercial and sport fisherman to everyday Alaskans sharing a salmon meal with their family. In a 2016 poll, 75 percent of Alaskans indicated that more should be done to protect the strong legacy of Alaska salmon for future generations. This year’s celebrations call attention to an energized movement of Alaskans seeking to protect wild salmon through updates to the state’s 60-year-old permitting law that dictates what impacts will be allowed to occur in salmon habitat. The group, called Stand for Salmon, represents a diverse range of Alaskan individuals, businesses and organizations committed to responsible and balanced resource development that includes protecting the state’s valuable wild salmon runs and transparency in government decision making in the face of a growing and changing Alaska. Anchorage – Cuddy Family Midtown Park, 5:30 – 9 p.m.
Soldotna – Soldotna Creek Park Pavilion, 6 – 8 p.m.
Dillingham – Dillingham Boat Harbor, 3 – 6 p.m.
Talkeetna – Susitna Salmon Center Lawn, Sunday Aug. 13, 10 a.m. – 5 p.m.
For updated event details and more information about Alaska Wild Salmon Day, visit www.aksalmonday.com. Stand for Salmon is a diverse group of Alaska-based individuals, businesses, and organizations united in taking immediate steps to ensure that Alaska remains the nation’s salmon state for generations to come. Learn more at www.standforsalmon.org.